Start-Up Activity Rising, But Slowly | Challenger, Gray & Christmas, Inc.
Over the first and second quarters of 2014, an average of 5.5 percent of job seekers started their own business. That was down from the second half of 2013, when the start-up rate averaged 6.9 percent per quarter. However, it was up slightly from the same period a year ago, when just 4.1 percent of former managers and executives started their own business. The latest findings on start-up activity are based on a quarterly survey conducted by global outplacement consultancy Challenger, Gray & Christmas, Inc. among job-seeking managers and executives who found employment, started a business, or retired. “The start-up rate can fluctuate significantly from quarter to quarter. In the fourth quarter of 2013, for example, nearly nine percent of jobless managers and executives started a business. The percentage then dropped by 50 percent in the following quarter. However, the overall start-up rate is trending upward from record lows in 2011, albeit slowly. Even with the increase, though, less than 6 percent of job seekers, on average, are willing to try their hand at entrepreneurship,” said John A. Challenger, chief executive officer of Challenger, Gray & Christmas. 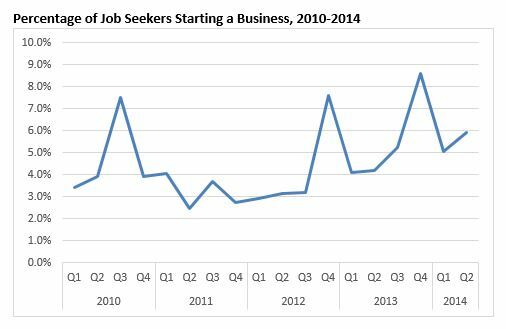 “We tend to see an increase in job seekers starting businesses in the immediate wake of a downturn, as job openings decrease. Once we start to see job gains, even in the nascent stages, people start moving away from the relative uncertainty of self-employment toward more traditional job opportunities,” said Challenger. According to the latest data from the Bureau of Labor Statistics, there were 93 metropolitan areas with unemployment below 5.0 percent. At unemployment rates below 5.0 percent, it becomes difficult for employers to find talent in the local labor pool. As of June, the Bureau of Labor Statistics counted 8.6 million self-employed workers nationwide. That represents about 5.8 percent of the nation’s 147.1 million workers, which is virtually equal to the percentage of job seekers starting businesses in the Challenger survey. “Even in the best economy, starting a business is a significant challenge. We are not talking about starting a factory or a tech firm, which presents an entirely different level of complexity. The vast majority of the entrepreneurs represented in our survey are starting one-person operations as consultants, contract workers, or freelancers. Even at this level, though, the cons to starting a business typically outnumber the pros,” said Challenger. “In addition to whatever service or expertise these entrepreneurs are providing to clients and prospective, they must also take on the roles of marketing and business development, accounting and business management. Further stress and anxiety come from the fact that the start-up operation is typically funded by friends and family, personal savings, and/or credit cards; not venture capitalists or investment banks. All of these factors make can make self-employment a daunting endeavor, which is why less than six percent are willing to take this path,” he said.